This second edition has extended the coverage from 1999 to 2009 but follows the format of the first edition. Colour is only used for the covers. Each entry includes black and white photographs and/or drawings – this is a most detailed record of military aviation losses and will be greatly appreciated by aviation professionals and enthusiasts. It also provides an excellent source book for risk management professionals. In view of the recommended price, this book is outstanding value and the excellent selection of photographs and drawings will make this an attractive book for a much wider audience. DESCRIPTION: This second edition has extended the coverage from 1999 to 2009 but follows the format of the first edition. Colour is only used for the covers. Each entry includes black and white photographs and/or drawings. The author has taken ‘significant losses’ to mean a loss where at least 20 fatalities were caused, but he has also included incidents where fewer casualties resulted but where the crash was noteworthy. The very first crash was of a Wright Type A flown by Orville Wright, who was seriously injured, and a US Army passenger on a demonstration flight, taking place on 17th September 1908. The passenger suffered a fractured skull and died later of his injuries. This first entry of the first reported crash includes the cause of the incident and provides a concise account of the flight, a formula followed through the book. A book of this type is unlikely to provide a truly complete history of significant military aviation losses and does not attempt to include crashes induced by enemy action. To attempt to include action losses would produce a mammoth epic or a long line of volumes, but wartime losses are not always easy to categorize because some aircraft simply went missing. On a bombing raid, there were losses that were unexplained and may have occurred as a result of pilot error or mechanical or structural failures. If there was no enemy claim for downing the missing aircraft, it could have been fatally damaged by anti-aircraft artillery, or an enemy aircraft might have caused it fatal damage but also been lost, so that no conclusive cause of loss could be identified. The author has included some wartime losses during the 1914-1918 War and the 1939-1945 War where the crash was known to be the result of aircraft failure or pilot error. He has also included very brief entries to record battles/campaigns where significant numbers of aircraft were lost. The other area, where some incidents are not recorded, is in the early years of flying when builders and governments deliberately failed to record every crash on the grounds of national security or commercial reputation. Equally, the process of reporting and investigating aircraft losses only achieved a widespread formal basis after the 1914-1918 War. Even then, systems evolved into national Aviation Authorities with a brief to regulate the manufacture and flying of aircraft and it was not until after 1945 that the system we now take for granted had been established. There was also no flight recorder before 1945 as a standard item of equipment to provide a record of sensor readings and voice traffic. As a result, the aircraft had to survive sufficiently to disclose any structural failure or for the crew to survive to provide an account. As the earliest incidents were likely to involve a very small number of crew, and where there were no fatalities, they would only be relevant to this book if there was a significant factor other than financial or human loss. 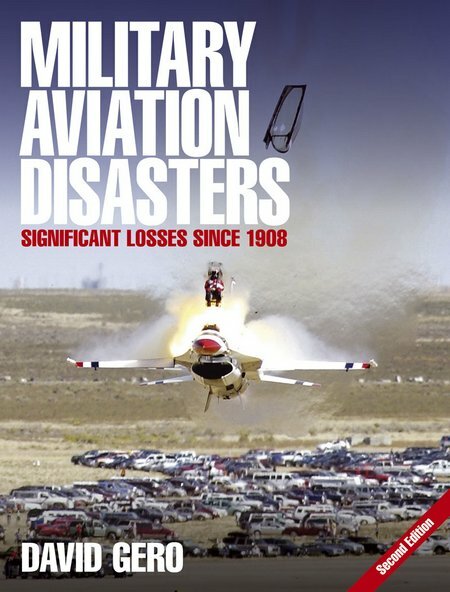 Taking those factors into consideration, this is a most detailed record of military aviation losses and will be greatly appreciated by aviation professionals and enthusiasts. It also provides an excellent source book for risk management professionals. In view of the recommended price, this book is outstanding value and the excellent selection of photographs and drawings will make this an attractive book for a much wider audience.